Every year, more than 1 million people die in traffic-related accidents around the world and research shows that driver fatigue (or drowsiness) contributes to about 25-33% of fatal and serious accidents. This is equivalent to 300,000 lives or more lost every year. For people aged between 15 and 29, road traffic accidents are the most common way to die. In order to tackle this issue, automotive technologists have developed the so called driver fatigue monitoring systems, which are able to detect driver fatigue and hence reduce the probability of traffic accidents. 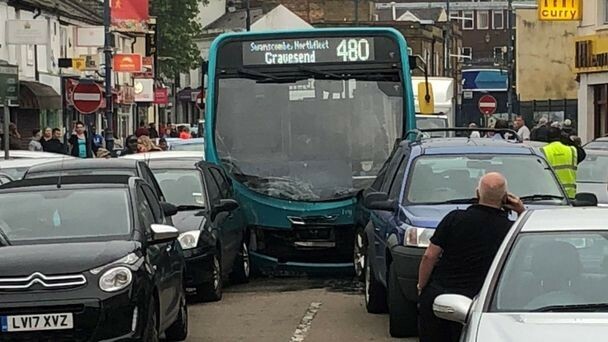 This is particularly relevant in the public transport sector and last year Transport For London announced a fund of £500,000 for bus operators to develop safety improvements, fatigue monitoring being a key part of this initiative. Driver fatigue refers to the driver’s mental or physical disorders due to lacking of sleep or long time driving, which results in the decreased control of the vehicles. This is not an accurate definition and reflects the complexity and enormity of tackling fatigue within fleet operating company. In fact, fatigue, let alone drivers fatigue, has not a scientific definition. Please note that from the viewpoints of physiology and psychology, the concepts of fatigue and drowsiness are different, but in the literatures found in the field of ITS, fatigue and drowsiness are synonymous terms. Hypo-vigilance is another term means lack of consciousness and may include drowsiness, distraction or both. A complete but subjective measure of fatigue is given by the Karolinska Sleepiness Scale (KSS), which describes 9 levels of drowsiness. This is a subjective scale, which can be used to self-assess fatigue. However, this cannot be used to continuously monitor individual levels of alertness, which is why there are companies in the automotive industry coming up with driver fatigue monitoring solutions. Driver fatigue monitoring solutions are based in the relation between the fatigue/drowsiness and body temperature, electrical skin resistance, eye movement, breathing rate, heart rate, brain activity or even driving behavior. Let’s look at the three type of monitoring systems that exist today. When a driver is in fatigued, his physiological response becomes slower, his body's response to stimulation appears to be delayed and his physiological indicators will deviate from a normal state. Therefore, this fatigue monitoring systems collect driver's physiological parameters by physiological sensors to determine whether the driver is tired. 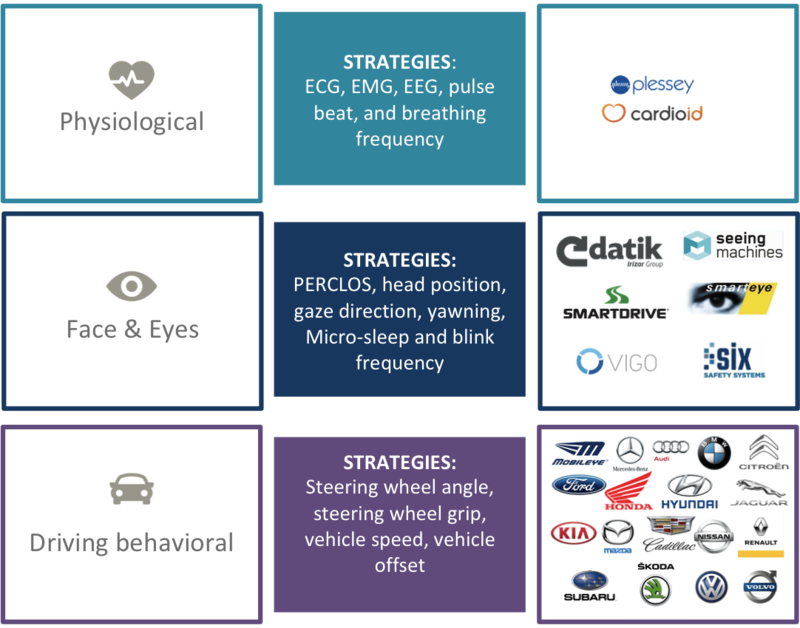 There are multiple systems in this category but the majority EEG, EMG, Pulse beat and breathing frequency) are intrusive and hence are not practical for implementing them in vehicle. ECG on the other hand is not intrusive and there are some good applications such as Warden or CardioWheel. These systems are easy to implement and operate but the sensitivity is poor and each requires individual adjustments for each driver. This systems are based on the fact that facial features of a fatigued driver differ from that of an alert driver. The latency between the visual stimulus and its response is one of the main measures to determine the consciousness. This latency is known by a parameter called Psychomotor Vigilance Task (PVT) that shows the response speed of a person to his/her visual stimulation. Researches show that there is a very close relation between PVT and the percentage of closed eyelids in a period of time (PERCLOS). Therefore, there is a close relation between fatigue and percentage of eye closure. Driver facing camera systems can use this relation to estimate driver fatigue/drowsiness. PERCLOS is a key parameter but other facial features such as head position detection, gaze direction detection, eye blink frequency detection, microsleep and mouth state detection are also important. When alertness reaches a low level, the driver’s ability to observe the surroundings, judge the situation and control the vehicle declines. This reduces the precision control of the driver’s, which is normally reflected by an abnormal fluctuation of vehicle driving parameters. This can be harsh braking, sudden acceleration or lane departure for example. The acquisition of this data from the vehicle is easy and it is possible to indirectly detect the driver's fatigue degree through the modeling of these data. Popular solutions include steering wheel angle detection method, steering wheel grip detection method, vehicle speed detection method, vehicle offset detection method, brake pedal force detection method and the accelerator pedal force detection method. This area is most developed for the consumer industry, due to its simplicity but it has the disadvantage of only detecting an advanced fatigue state. Providers of these solutions include most car manufacturing brands like Mercedes and Volvo, and technology providers such as Bosch. A long list of solutions within this category can be found in wikipedia. 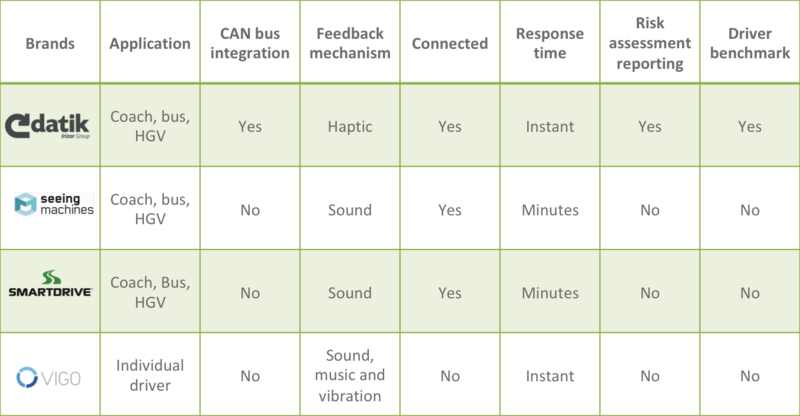 Comparison of driver fatigue monitoring systems. Detecting fatigue can be a good way to reduce accidents. We learned that the industry have come up with 3 main families of driver fatigue monitoring systems, each with multiple solutions and approaches, with their own advantages and disadvantages. As shown in Table 1, we have compared broadly the 3 families and compared them in terms of accuracy, sensitivity, contact and cost. The main advantage of the fatigue detection method based on driver physiological parameters is that it can objectively and accurately reflect the degree of driver fatigue. The disadvantages are that data acquisition equipments are complex and expensive; the most accurate solutions require the equipment to contact the driver’s body directly, which affects the normal operation of the driver and the traffic safety. Therefore, the application of this method to the actual driver fatigue detection is limited. The advantage of the fatigue detection method based on driver facial can accurately determine the degree of driver fatigue. However, the recognition algorithm is complex, the feature extraction is difficult, and the detection results are easily affected by the illumination and occlusion factors. Deep learning technology can make a remarkable achievement in this area and therefore it is believed that this type of solutions will be mainstream in the near future. Fatigue detection method based on vehicle driving parameters has the advantage of being simple. The disadvantages are that its analysis result is easily influenced by personal driving habits, the weather, traffic conditions and other external factors, the accuracy is not enough; moreover, the method can detect the abnormality only when the driver is about to have an accident, which is not safe for driver. Therefore, the analysis result of this method is better to be used as an auxiliary detection indicator rather than the main detection indicators. While technology is making a remarkable improvement over the years, it is still a challenge to detect a particular type of drowsiness. As we learned with KSS, fatigue is not black or white, but an dynamic array of greys, and so, what “grey” is it that we want to detect and under which conditions? In short, when should the driver be warned and when the fleet operator informed? Fatigue has to be understood as a risk, that is, as a probability to have an accident. Little research has been conducted in this area, if none at all. This has an impact in the definition of accuracy for these systems and therefore for the development of the technology. What is the minimum risk fleet operators are prepared to bear? Is the technology there to detect early signs of fatigue or very low alertness levels? From this point of view facial feature monitoring based solutions seem to provide a better framework of analysis because they can be programmed to detect different levels of fatigue. However, more research and development has to be carried out in order to accurately detect early signs of fatigue and to translate fatigue into actionable information for fleet operators.